What Color Was Your Day? Discussion of classroom rules. I ran into the parent of a former MAB student who has been in public school for a few years. Her daughter is doing well by all standards, but she went on to explain one particularly troubling and all too familiar experience for so many students in our traditional education system. In her daughter’s class all students receive public judgment on their behavior from the teacher throughout the day. They are assigned a color based on the following scale: Green = good, Blue = warning, Red = bad. Teachers and administrators use other words to define what the colors mean, but these are the words the children use. A child’s day may start on green, but certain behaviors, subjectively determined by the teacher, could move it to blue. In which case, the child is instructed to place his or her name tag on the color indicated by the teacher -for all to see. From there, worse behavior could move him or her to red while improved behavior could move the child back to green. The color upon which the child ends the day represents the teacher’s view of his or her overall behavior. This color is then recorded by the child on a sheet and given to the parent to initial and return the next day. This post is not about a systemic failing in the public education system and it is not an attempt to vilify teachers, most of whom are doing all they can to help their students. This is, however, an indictment of the manner in which social and emotional development is neglected in the place where children need it most. There are many iterations of this policy including more colors, clip-up-clip-down scales, behavioral matrices, three strike rules, zero tolerance policies and all sorts of punishment and reward systems. This story is just one of many. The truth is that behavioral policies like this often just become an automatic part of the classroom. They are handed down from teacher to teacher, without consideration for their efficacy, as go-to techniques for a quiet and orderly day. But they are as indefensible as corporal punishment in schools (which is still allowed in 19 states across the country -but that’s a topic for a later discussion). School policies and the standards under which students are expected to conduct themselves should empower children to make their own decisions between right and wrong and to develop essential life skills in order to prepare them for life beyond the classroom walls. These policies should be written in consideration of the needs and interests of each child as an individual while seeking cooperation with the child as a responsible and active participant in his or her own development. This color-coding system fails to meet these criteria in nearly every possible way. Quality education requires thoughtful, effective communication. By nature, adults and children communicate differently, so in teacher/child interactions, it is the adult who should make the accommodation. What are the possible adult messages this policy communicates to children? 1. Children who repeatedly receive red/blue assessments may feel labeled and embarrassed by being exposed in front of their peers on a daily basis. This could result in low self-esteem and exacerbate misbehavior. Self-fulfilling prophecies are difficult to escape. 2. That life is based upon a point-for-point accounting of successes and mistakes. This could result in a child who avoids challenges lest a mistake or failure be counted against him. Surely our education system seeks to produce children who seek out challenges and view mistakes as opportunities. 3. That the reason to behave appropriately is to end the day on green, while the reason not to misbehave is to avoid ending the day on red/blue. This could result in a child who chooses behavior to avoid/receive consequences/rewards for himself rather than considering how his behavior affects others. Assigning rewards/points or external items to behavior may achieve short-term compliance, but studies show that this fails to promote long-term understanding and application of the underlying concept. The reason to obey the speed limit is because you might injure yourself or someone else, not to avoid the ticket. 4. That the color you receive is representative of your entire day. For example, a child successfully read his first book today, or made a new friend, but ended his day on blue because later he disrupted the class. Instead of leaving the day empowered by his accomplishment, he must give his parents a sheet which says that he “had a bad day.” Adults/teachers understand that a child’s day is composed of many parts and while we would not view this child’s day as a complete failure, this distinction cannot be understood by a 6 year old. This former student is one of those thoughtful people. Most Montessori children are. Do you know what her biggest problem with this policy was? More important than the color she took home each day was her concern for the little boy who ended nearly every day on red. “Mom. He almost never gets a green and I think it makes him really sad.” she said. How is it that a 7 year old girl can see the inherent flaws in this policy and somehow the adults cannot? A pessimist would assume that these policies exist because adults believe without constant reminders, punishments and rewards, children are naturally predisposed to cause trouble. But the good teachers don’t believe that. Not for a second. 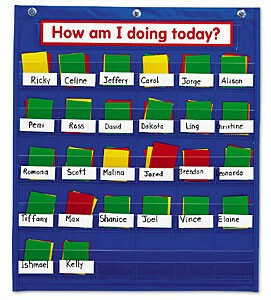 So when presented with the ideas above, most teachers will agree that no good can come from color-coding a child’s day. But nothing will happen unless someone speaks up. That’s where you come in. If you find this kind of policy taking place in your child’s classroom (and it happens WAY more than you might think), don’t just go along with it. If yours is the child on red every day, the teachers are expecting you. While the policy isn’t communicating effectively with the child, it is at least sending a message to you (albeit an inaccurate one). But don’t let that deter you. You are speaking on behalf of ALL children, not just your own. Likewise, if your child gets a green every day, your voice can speak for those who do not. Meet with the teacher or principal and present the points I have detailed above. Add your own if necessary. While this is all very convincing to us, it is a difficult thing to look at what you have been doing for years and admit that it doesn’t work -and perhaps never has. So this is not a one-conversation endeavor. In fact, be prepared to defend your position, but there is no need to be adversarial. What is needed is an open discussion, preferably among a group of teachers to quickly work toward consensus. Pointing out the problem is one thing, but you’ll make it no further without offering solutions as well. So here are a few I have come up with. This is by no means an exhaustive list and there may well be better options out there. So, again, feel free to add your own. –Draw up a contract of classroom rules, signed by all students. Review, discuss and amend the contract as part of an ongoing interactive process. –Young children children could create a picture book each week illustrating examples of positive behavior. To save time, use a sheet with examples (written/pictures) of positive behavior – which children could circle/color to identify. –Older children could write journals detailing acts or ideas they they witnessed, or did themselves. –Regular open-ended discussions and story-telling where children are able to identify examples of positive behavior or discuss school and classroom rules. –Adopt a virtue of the week/month (honesty, generosity, etc.) and begin with a discussion of why that virtue is important and come up with examples. At end of the week/month engage in a discussion of how/if children observed this virtue in or out of school –children can also write/draw pictures to combine academic learning. –Pair up with a buddy periodically -rotating throughout the year and collectively discuss examples of the virtue, or positive behavior witnessed in/out of school –to be shared at a regular meeting or written and turned in to the teacher (for later discussion). You’ll notice that I did not offer options for punishment or consequence. That’s because when children are given ownership of their environments and the opportunity to take charge of their own learning, the instances of disruptive behavior are greatly diminished. At that point, consequence and discipline may be handled individually through collaboration with the child. Once these ideas are established, it is important to allow and expect that partnership with the children. Give them the chance to contribute and they will take it. As I said, accepting this is no easy task. Even if the teachers agree in principle it may be the case that they do not have the resources (namely time) to devote to making a change. However, if you do encounter that problem, it is time to talk about systemic failure. Because if we truly don’t have the time and resources to help children learn these life skills, then the problem is bigger than punishment and rewards. When all else fails, teachers need to be reminded why they chose this profession in the first place. We all need our faith renewed now and then. Because too often teachers are met with discouragement, disrespect and distrust. Some of them are completely dissed out. However, all of them love their students and they work to give each and every child the chance to change the world. So when you meet with the teacher or the principal, let them know you are there to help. You are there for the same reason they are and if anything is going to change, it will come because we all worked together.